Whether your interest is China in the 1930s and 1940s, the industrial cooperative movement, the role of foreigners in relief and development work in Asia, or just a very good biography about an ordinary but extremely talented and courageous Englishman who did extraordinary things in his short life, you’ll find Blades of Grass: The Story of George Aylwin Hogg (1915 – 1945) a fascinating read. 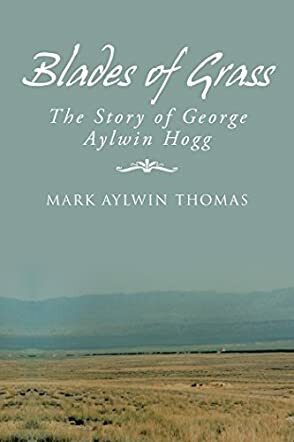 Authored by his nephew, Mark Aylwin Thomas, it’s based on the memories of family and friends and, most importantly, contains Hogg’s personal and very detailed letters and writings. Less known in the west, Hogg is viewed in a heroic light in China, especially for his work in support of the “Gung Ho” cooperative movement and technical training schools, during a period of violent regional military and political conflicts that were blossoming into world wars in Asia and Europe. Illustrations, a map of China, a Chinese historical timeline, a key to pronunciation, and lists of references and sources are included. I really enjoyed reading the portrait of George Aylwin Hogg presented in Blades of Grass. Thomas’ narrative is engaging, well-organized, well-paced, and educational. Hogg’s own writings make his experiences and adventures vivid and real. I was immediately captivated and didn’t want to put the book down, as one adventure led to another. Hogg’s qualities as a human being and a man shine through his writings. He wasn’t alone in doing what he could to provide relief to the Chinese people during these chaotic decades when many were left homeless, hungry, and orphaned. His story gives credit to others with whom he worked. But, George Aylwin Hogg had a unique spirit, capability, and courage that will inspire those who read this book.